Thursday during the winter break, i.e. 14 February 2019, you can learn about the numerous bunkers still remaining on the west coast on this bunker excursion. The bunkers at Houvig are a monument to a not-so-distant past. They tell a story about loss, about much too young and much too old German men who went to war, about modern technology, about bombing raids, and about occupied Denmark. 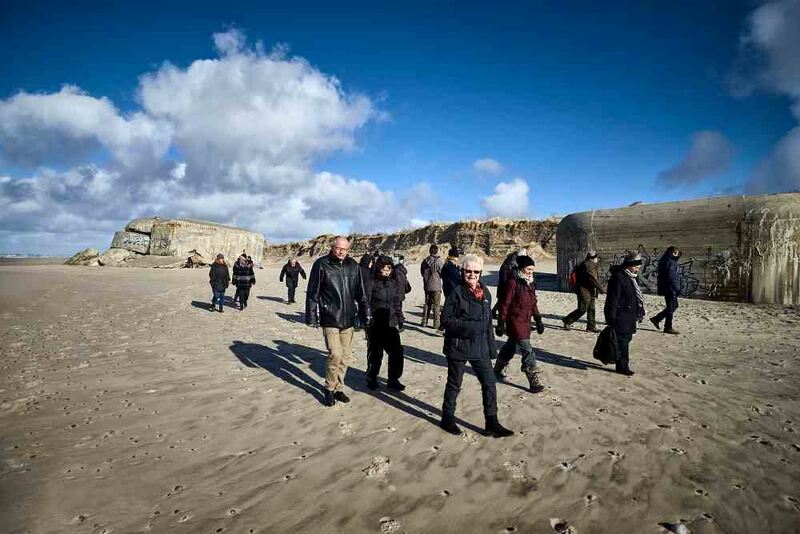 During the winter break week (which starts on Monday, 11 February) the whole family can join the bunker excursion and learn about the concrete monuments on the beach. During the excursion you can hear how Houvig Fortress includes two different parts of the Germans’ defence strategy during World War II. The bunkers formed part of the Germans’ Atlantic Wall which was intended as a guard stretching from southern Europe to northern Norway – a defence against an Allied invasion. The Atlantic Wall was never completed but the bunker ruins at Søndervig still tell the tale. The bunkers were armed with ancient cannons and peopled with German reserves in the form of old men and young boys. In contrast to this is ‘Ringelnatter’, which was the Luftwaffe’s top modern anti-aircraft position. From here, orders were sent to the German night fighters. Ringelnatter has many Allied airplanes on its conscience. We will pass through the area where Houvig Fortress was. Many of the bunkers are still visible while others are more or less hidden in the dunes. It is possible to enter some of the bunkers, so we recommend that you bring a flashlight. If you would like to learn even more about this piece of history, then the obvious choice would be to visit Ringkøbing Museum, where there are two exhibitions based on Houvig Fortress. “Night fliers” tells the story of the 19 allied airplanes that Ringelnatter shot down at Ringkøbing Fjord during the war. In 2008 an almost untouched bunker from World War II that was abandoned in 1945 showed up – and was thereafter covered by drifting sand. Today, the bunker has been reconstructed at Ringkøbing Museum. You can enter the reconstructed bunker and watch a film about the time when the then 17-year-old Gerhard Saalfeld was posted in the real bunker, at the exhibition “What the bunker hid”. Date: Thursday, 14 February. Danish guide 4:00-5:30 p.m. German guide 1:30-3:00 p.m.
Tickets can be bought at the start of the tour, at Ringkøbing Museum or the tourist office. The tour is approximately 2.5 km long and takes place in hilly dune landscape.